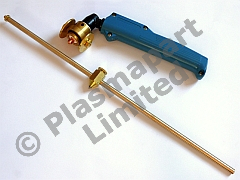 Wheeled cutting guide and circle cutter suitable for use with the Panasonic P 80 torch - perfect for use with the second generation SIP Plasmas! enabling both straight guided cuts as well as circles and arcs to be cut. At last, a wheeled cutter guide for the P 80 Torch!! This is a well made from machined brass and is also chrome plated. The guide is supplied complete with a circle cutting bar so can cut accurate circles in metal plate. This accessory is fantastic and we highly recommend it. It features a hardened steel point to centre the circle cutter guide on a small centre punch mark or small hole. The wheeled cutter guide simply screws onto the circle cutting bar and is easily removable for use as a wheeled cutter guide on its own freehand or against a rule / box section for straight cuts - giving a stable supported cut and accurately controling the distance of tip to workpiece giving better, cleaner, perpendicular cuts. This device can increase the life of cutting consumables. This pack is supplied as shown, and contains 1 wheeled guide and circle cutter bar. The P 80 torch head shown is not included but is available from our shop. All items are dispatched immediately after purchase by 1st class Royal Mail, or airmail if you are buying from outside the UK. Please contact us and let us know if you require parts to be delivered the same day - this is available at extra cost. Discounts are available for multiple purchases, please see the discount table below - discounts are automatically applied when the required quantity is added to the cart.